In Spring of 2015, I planted a peach tree in our backyard at my wife Ann’s request. Much to her disappointment, we harvested ZERO peaches the first summer. Talk about feeling like you let your wife down! I researched peach trees and learned when, where and how to plant it, when and how much to water it, what and how often to feed it, and I staked it down in the perfect spot. Despite doing all the “right” things and following all directions, no fruit. One month ago, Ann ran into the house from the backyard excitedly yelling in a high-pitched voice, “Have you seen the peach tree? There are millions of them!” While I don’t think there were millions of them, there definitely were hundreds of them that seemingly budded over night. 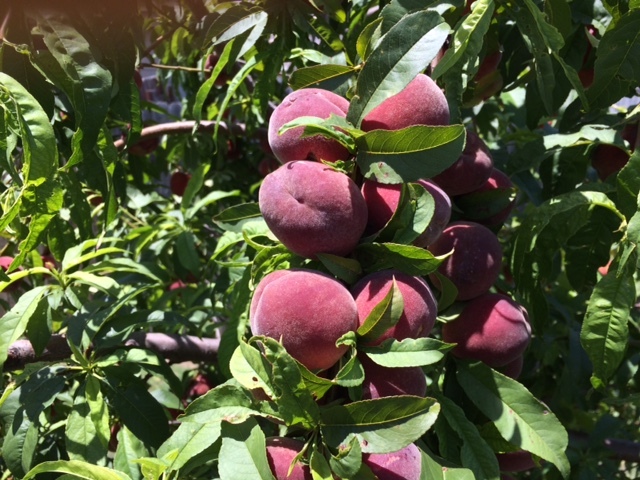 There are now so many peaches on the tree that the limbs are sagging. I couldn’t help but wonder how in the heck the results could be so different just one season apart. I didn’t do anything ‘better’ this season. In fact, if anything, I did less this year to help the tree thrive! I have had both kind of seasons in my life. I have worked hard, done all the right things, read all the books, taken all the classes, and sought all the wisdom only to be disappointed and see nothing come to fruition. I have also had the season of life where I was steadily producing fruit like crazy only to realize it was weighing me down. 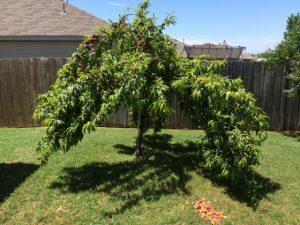 Ann and I have been reminded of a few Godly character traits in watching our peach tree go through two distinctly opposite seasons. Forbearance is defined as patient endurance or tolerance. Forbearance is filling out yet another application when the last 10 have not gotten you so much as a call back. Forbearance is working hard that first week back at the gym, knowing fully that you will look exactly the same on Friday as you did on Monday. Forbearance is praying again today for that person you have been praying for months on end without having seen results. Faithfullness is remaining steady in your allegiance or true to your words. Faithfulness is watering that tree daily because that is the responsibility you assumed when you agreed to plant it. Faithfulness is pouring 100% into your marriage even though your spouse is not responding the way you want them to. Faithfulness is performing your job exactly the way you’re supposed to even when cheating would make you more money. I witnessed my wife display forbearance and faithfulness each time I rejected her invitations to church. She would just invite me again the next week knowing that I would likely respond in the negative once again. Her forbearance and faithfulness, which I have labeled as patient persistence, won me to Jesus Christ. All those years of fruitless limbs and disappointment, all of a sudden so incredibly worth it. Forbearance and faithfulness. There are those times in life where your productivity is at its peak and things appear to be perfect. It is in these times when exercising self-control and learning the value of being at peace can prevent you from feeling the incredible weight that can accompany accomplishment. Our peach tree was producing so well for such an extended period of time that the limbs actually began to sag to the ground and some even broke off under all of the weight. It was doing so well it was hurting itself! We can get so focused on being productive that it begins to have adverse effects on our lives. We can get so busy and spend so much time working to make money (produce fruit), that the pressure it creates at home can damage our marriage or relationship with our children. We can put so much pressure on the shoulders of our kids by having them in 4 different extra-curricular activities that they actually lose interest in all of them. Self-control is the ability to slow down and forego certain opportunities that feel right in the moment to do what is best in the long-run. There is nothing wrong with working hard or having busy recreational lives. But, along with too much production and busyness comes chaos and conflict. Peace is the absence of or freedom from conflict and chaos. We have to be cautious to not have so much fruit growing at once that it puts an unsustainable amount of weight on our lives. Sometimes we work diligently and patiently and produce what seems to be nothing. But forbearance and faithfulness see us through and fruit is eventually the product. Sometimes we produce so much fruit that we need to exercise self-control and learn that peace is more important that productivity. Galatians 5 tells us that “the fruit of the Spirit is love, joy, peace, forbearance, kindness, goodness, faithfulness, gentleness and self-control. Against such things there is no law.” Who better to teach us about the fruit of the Spirit than a peach tree? And now you’re leaving that peach tree behind, letting someone else enjoy the fruits of your hard work! Great article!